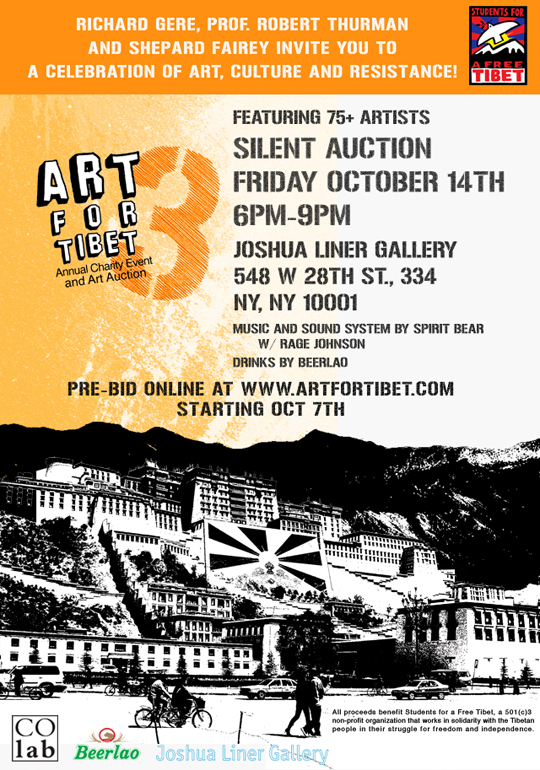 ART FOR TIBET is an annual charity auction that showcases work from a diverse international pool of established and emerging artists, including a growing number of outstanding contemporary Tibetan artists. For many Tibetan artists this show is a rare and vital opportunity to express their artistic voices and exhibit their work without risk of imprisonment. In 2011, ART FOR TIBET expanded to include events in New York City and Toronto (London Calling in 2012!). If you don’t live near one of these cities, you can still support Tibet by placing bids in our online auction. Art plays a vital role in Tibetan culture, and has long been a profound tool for social and political change. In a more immediate sense, this auction raises critical funds for Students for a Free Tibet (SFT): a nonprofit global grassroots network that campaigns for Tibetans’ fundamental rights to freedom and human rights and trains young Tibetan and non-Tibetan youth worldwide in strategic nonviolent action. Visit www.studentsforafreetibet.org to learn more. 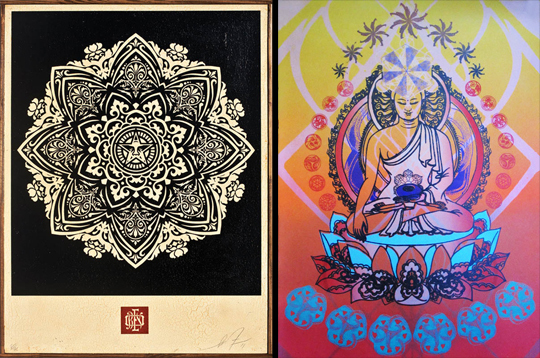 We are grateful to the support of our Honorary Committee members Richard Gere, Professor Robert Thurman and Shepard Fairey. Mio Murakami, Mike Ming, Mike Schreiber, Ben Baker, Nancy Jo, Lhakdon and Norden Johnson, Naomi Kazama, olive47, Omen, Pablo Power, Palden Weinreb, Pema Rinzin, Peter Parpan, Philip Sugden, Rabkar Wangchuk, Rage Johnson, Richard Gere, Rostarr, Ryan McGinness, Sangeetha Kowsik, Scott Price, Shan Jayakumar, Shepard Fairey, Shie Moreno, Sonam Zoksang, Spencer Wilson, Steven Cogle, Steven Daily, Swoon, Tashi Norbu, Tenzing Rigdol, The Sucklord/Suckadelic, Tomokazu Matsuyama, Tomoko Sugimoto, Tun Myaing, Yojiro Imasaka, Yuri Shimojo, Yvonne Jacquette More artists added daily.